Is a defense attorney bound to defend his client, or with his conscience, when he knows that the man he is defending is guilty of the charges against him after the trial has already commenced? And if friends hold a belief that he may have been aware of it before the trial commenced, yet they are endeared to the man and his family as upstanding and of the highest grade? Might it not become cause for blackmail, and therefore potential retribution? 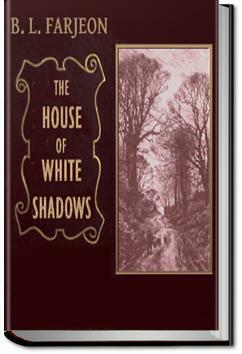 "The House of White Shadows" brings these issues to the forefront, while the reader learns of the background of the advocate, his family history, and the house in question. . . .Her humour changed again. "A mystery!" she exclaimed with child-like vivacity, "in a place where news is so scarce! It must be delightful. What is it about? There is a woman in it, of course. There always is." "Yes; a young woman, whose body was found in the Rhone." "Murdered, as it at present seems." "The wretch! Have they caught him? For of course it is a man who committed the dreadful deed." "One is in prison, charged with the crime. I visited him to-day." "Surely you are not going to defend him?" "It is probable. I shall decide to-night." "But why, Edward, why? If the man is guilty, should he not be punished?"